The ruins of Myra are situated 5 km from the shore. On reaching the city, the first thing you see is the acropolis on top of the hill, which is literally covered with Lycian rock tombs. The city walls dating to Hellenistic and Roman periods can still be seen. Most of pigeon hole type tombs (called simple niches) and house type tombs are damaged, but some inscriptions and reliefs are still visible. The theatre – The cavea of which is half Greek and half Roman in style – is situated near the necropolis, and is in better condition than the other theatres in Lycia. Vaulted passage entrances and the stage building are also in good condition. St. Nicolas was born in Patara and lived in Myra. In the 4th century he was the Bishop of Myra until the end of his life, and was buried in his church. The church of St. Nicholas in Kale (Myra) was collapsed in an earthquake in 529; a larger church, perhaps a larger basilica-type structure was built in its place. The Church of St Nicholas was razed to the ground during a naval assault conducted by the Arabs in 1034. An inscription reads that it was restored under Constantine IX in 1043. Some additions were made during renovations in the 12th century, and the church was finally renovated in its present position during the 19th century and again after Atatürk leaving an excellent example of Anatolian – Byzantine architecture. In the 11th century Italian pirates broke open the sarcophagus of St. Nicholas and took his bones to Bari, in Italy. St. Nicholas’s Roman style decorated sarcophagus still stands in the church. This perfect Mediterranean village boasts a pretty yacht harbour, seafront restaurantsand charming hotels and pensions, making it a popular place preferred by thgose in search of a more laid-back stay in Turkey. From Kalkan there is an opportunity to visit important Lycian cities such as Patara, Xanthos, Letoon and Tlos by bus and return to the boat the same day. The harbour is a good place for overnight stays. According to ancient sources, the mosque in the harbour was build after the 14th century on the site of a destroyed Roman Temple, and had also been a Byzantian Church during bygone ages. Now, the mosque, the winding cobbled streets lined with well preserved Greek houses and an abundance of red and pink bougaivillea makes Kalkan a storehouse of beautiful photographs as well as living evidence of the continuity of life and the colourful fusion of different cultures. 15 miles from Kalkan, Kas is another sheltered harbour where you can stay overnight. 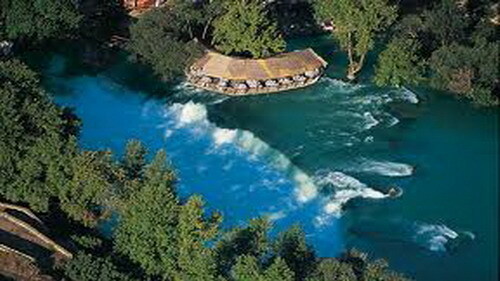 Kas has also became a popular tourist centre with its historical and natural ambiance. The modern town of Kas has many remains from the Lycian period when the town was named Antiphellos. The rock-cut tombs on the slopes of the surrounding hills date to the 4th century BC. On a rise between the sea and the hill which was probably the acropolis of Antiphellos, you can see a rock tomb decorated with a Doric style façade and dancing female figures inside. To the west of the modern town following the road to Çukurbag Peninsula, the ancient theatre of Antiphellos appears. The Cavea of the theatre was made with 26 seating rows for a 4.000 people capacity. This faces Meis (Kastellerizon) Greek Island 5 miles away. Among thousands of sarcophagi in the whole Lycia, one is used as the modern symbol of Kas town. It stands at the upper end of Uzun Çarsi Caddesi 5 min. walking distance from your boat in the harbour, and its excellent preservation and elegant form is impressive. The Hyposorium of the sarcophagus has Lycian inscriptions, which explains the importance of the person who was buried there and the rules on how to protect this monumental tomb. Kekova, with its incredible beauties is one of the best-loved anchorages of blue voyagers, where history and nature come together. After departing Kas, first you pass Uluburun opposite Meis (Kastellerizon) Island and Sicak Peninsula where the ancient city of Aperlae was found. Name of Kekova is taken from the Island, which is covered with ancient ruins. The lake like sheltered sea between the Island and the main land is also called Dead Sea. Tersane Bay is located at the southwest of the Island where you find the remains of an ancient dockyard. 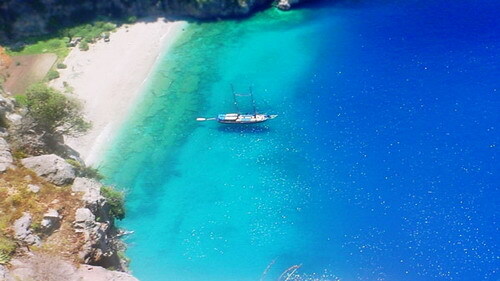 At the southeast of the Island there is another beautiful anchorage, is called Karaloz. Following shore, you can see many houses submerged in the water as the result of various earthquakes, which gives another name to the area – “sunken city”. 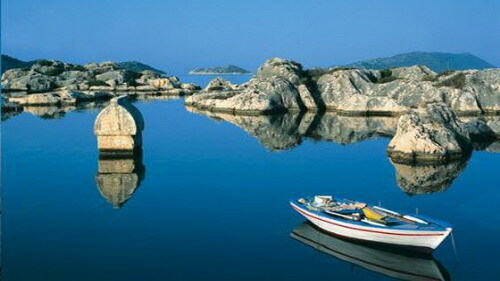 In Kekova region the safest place for anchor is the village of Üçagiz, which was called Theimussa in the Lycian period. From the inscriptions on the tomb it is understood that itshistory goes back to the 4th century BC in Theimussa town. Ruins of necropol give a very interesting picture resembling a field of sarcophagi. The ancient city of Simena can be seen on the island and where the village Kale is located. Kale is full of medieval and ancient structures, which are historical emblems of the village’s natural beauty. At top of the village a well-preserved castle stands which was reconstructed by crusaders upon a Lycian. Inside the castle, there is a very small theatre or Odeon, worth seeing. The most interesting sarcophagus of Kekova is one which, near the Kale Village stand alone in the water. On the mainland, many of other good samples of Lycian sarcophagi can be seen among the olive and carob trees. Kekova is probably one of the most enjoyable regions of the Mediterranean because of its impressive historical background, unspoilt nature and gorgeous turquoise waters. Just to preserve this beauty, people are not allowed to do scuba diving and snorkelling with masks, around the sunken cities. A resort town surrounded by high mountains and with a nice fully-equipped modern marina. Phaselis and Olympos are two sights that can be visited from Kemer. From Gemiler cruising towards the east, you reach a couple of bays suitable for anchorage and overnight stay. Bestas Harbour and Soguksu Bay give an opportunity to take a walk for an hour and visit the “ghost town”; Kaya Köyü, whose Greek population was exchanged with Turks living in Thrace in 1922. Mersinli Bay is another good anchorage and swimming spot. Rounding Yogan Cape from here, you enter the breathtaking Belcekiz Gulf. Here you’ll find Ölüdeniz, the world famous inland bay that is protected from the open sea by the cape, a lagoon of shallow, perfectly still, turquoise water completely hidden from view from the sea. This paradise is closed to yachts to prevent its pollution. Ölüdeniz is a popular tourist centre – backdrop of the magnificent pine covered mountains, the long white beach of Belcekiz, and the literally breathtaking blue of the sea make it a sight well worth seeing by land or by sea. Hotels, restaurants and campsites are located along the front of Belcekiz Beach. Looking up, the azure skies are punctuated by coloured parachutes gliding and spinning over the lagoon area from their flight point at the top of 1975 metre high Babadag (Mount Baba). This gives a new image of the resort – it offers the best wheather and landing conditions for the sport of paragliding anywhere in the world. Adrenalin and freedom… These two words pretty much sum up the paragliding experience. Another Lycian town. Its remains are dispersed in the nature beside a magnificent beach. Far beyond, the eternal flame of Chimera burns. One of the harbour cities of ancient Lycia. At the foot of mount of Olympe, the site is overlooking the sea at its three harbours. The sights include the aqueduct, the theatre, baths and the royal path amongst the pinewoods.